Consider, if you will, the nine-year old reporter from Pennsylvania doing her best (and it’s good) to report serious news in her hometown. Hilde Kate Lysiak publishes the Orange Street News from Selinsgrove, PA, and she’s not writing puff pieces about puppies or flowers. Her story went viral when she reported on a murder that took place early April just a few blocks from her house. I can’t wait to see what she can do by the time she gets her driver’s license. I also discovered that Sweden (yes, the country) has its own phone number. Dial the number (it is international, so watch those fees!) and you will be connected to a random Swede. That’s right, thousands of people have signed up to participate in this program, and incoming calls are randomly shunted to one of them when a call comes through. Call one minute and you might find yourself speaking with a professor in Uppsala, call the next minute and you could be put in touch with a (let’s say) restauranteur from Stockholm or Volvo employee in Arvika. No guarantees that caller and callee will speak a common language, but that’s part of the fun. There’s just no telling! Suggested topics of conversation include meatballs (yum), darkness (it’s like fine wine in France, they have a lot of the stuff but not everywhere), and feminism (yeah, my family’s ancestral homeland is awesome). All in the name of tourism, of course, but what a great way to humanize another culture. Both of the above topics are fun, but in the end I decided to go with something a bit closer to my writerly wheelhouse: Limitless. Open your mind. Double tap this first look if you're ready to become #Limitless! Sounds like a fine (if potentially generic) crime/investigative show. Except that it is nothing like your average CSI. When I heard the initial chatter about the series my dominant reaction was “meh.” What could they bring to the table as a series? A lot, it turns out. If you’re a fan of deep, serious drama look elsewhere (admittedly, I’m often not), but what the show does, it does very well. I like speculative fiction and I like humor, and like peanut butter and chocolate, the two are often better together. Limitless is one such case. The writers (and everyone else involved) are blending both humor and serious stakes together into one great whole. Breaking the fourth wall doesn’t begin to capture it. We are always happy to see an episode on the PVR, but we make sure to watch it after dinner. That way we won’t be distracted by an errant tomato and miss a quip, creative visual set piece, or hilarious aside. Sure, it’s a (mostly) lighthearted TV show, but that doesn’t mean it can’t do fun and interesting things with characters, plot, and presentation. Creative, innovative and downright fun, I’m enjoying the heck out of this show. And as I mentioned, it’s not a show I initially expected to like. The cast features established faces (including Mary Elizabeth Mastrantonio and Ron Rifkin) and (for me at least) newer ones, including the charismatic and entertaining Jake McDorman. While Bradley Cooper serves as executive producer and sometime guest star, the dynamics between McDorman and Jennifer Carpenter are what anchor the show. I recommend you start at the beginning of Season 1 rather than try to pop in mid-way for best effect. Why bring this up today? Because I realized that there are only two episodes left in the season and CBS has yet to renew. Prospects look good but after all the television-related heartbreak (of course I’m looking at you Firefly, but there are many more), I wanted to speak up. If you’re in the market for good, geeky fun dished out with sides of humor and crime-fighting, Limitless is for you. This has been today’s edition of #ThingsILike, sent from my writerly Headquarters (with an exclamation point!). I finally got to see The Martian this past weekend, and if you’ve been following the reviews at all my reaction will come as no surprise: it was great. What’s that, you’ve been busy/off the grid/media fasting? Here’s a trailer. 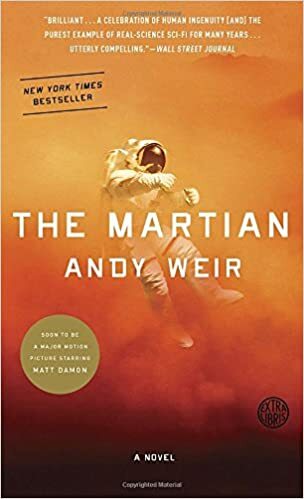 I read Andy Weir’s book last year so the specifics weren’t a surprise, but in this case knowing the story did nothing to detract from the experience. The execution, whether in terms of writing, acting, directing, or visuals, was a delight. The movie compressed the story in exactly the right ways, maintaining dynamism and tension in what could have been a dull one-man alone setting. Also, no stupid characters were required to move the plot. Yay! You may not agree with every decision, but at no point did the script make some hapless individual look down at a big red button under glass and say, “Gosh, I know they told me not to touch anything but I wonder what this does,” literally or otherwise. Also times two, smart, strong characters, women included. How refreshing is that? A lot has been written about the movie, and about Weir’s journey from self-published indie author to Hollywood hit, and it’s both interesting and well-deserved (see here and here and here and here, for examples). As an entertainment consumer both versions scored high for me. As a writer, I was impressed by Weir’s concrete attention to detail, his willingness to dig himself into seemingly impossible holes, and his facility at getting out of them in realistic ways. Drew Goddard did an excellent job translating the book into a screenplay (I’d expect nothing less from this Buffy/Angel/Alias+ alum) for Ridley Scott. Helping kids (and everyone else) see that science is about exploration, discovery, innovation, capability and (in this case) freaking outer space? That’s exactly the kind of story I can get behind. Recommended. Current trends in genre movies lean toward zombies, war, and the Apocalypse, but I’d like to take a moment to appreciate the benefits of humor in science fiction. Sure, our future planet may be filled with trash, our scientists mad, and our educational standards in decline, but at least we should be able to laugh about it. What is humor, if not a way to cope with (and thereby begin to address) our problems? I spend Saturday nights watching B movies of the science fiction and fantasy persuasion for just that reason. With that in mind, I settled in to watch Space Milkshake. Starring Robin Dunne (Sanctuary), Billy Boyd (The Lord of the Rings), Kristin Kreuk (Smallville, Beauty and the Beast), Amanda Tapping (Stargate, Sanctuary), and George Takei (Star Trek) as the voice of Gary the duck, the film allows each of these actors to emphasize their comedic strengths. The story is a classic crucible, sci-fi style. The setting is a future Earth where space debris is a serious problem, addressed by permanently-crewed orbital stations tasked with space lane maintenance. Geosynchronous trash trucks, if you will. While living on one such station our cast of hapless sanitation workers find their lives disrupted by a rubber duck from space. Needless to say, there’s more to the little yellow duck than meets the eye. George Takei does a wonderful turn as Gary; he is now my gold standard for voicing mutant rubber duckies. The rest of the acting team delivers as well. Kreuk is perhaps the weakest link here but her job is also one of the hardest, given that her character doesn’t speak for a significant portion of the film. And while it’s hard to imagine bathtubs would be feasible on such a future space station, it does allow for a tension-filled scene with Amanda Tapping in a bubble bath with the aforementioned duck. What could be better? This was my best B-movie Saturday night in a long time. Space Milkshake is a low-budget film with sets and special effects to match, but the movie is well put-together and the actors all appear to be having a terrific time. This is quality B-movie material, and I mean that in the best of ways. Think My Name is Bruce. The movie is also sprinkled with shout-outs to classic science fiction and fantasy like Star Wars and The Lord of the Rings, and is prime material for homegrown drinking games, should your proclivities lean in that direction. Space Milkshake is pure comic entertainment. And no, I don’t understand the title, but that didn’t detract from my enjoyment. If you have a soft spot for science fiction that embraces goofy fun, and enjoy well-scripted, conscientiously-acted movies, you should see this film. Bottom line: if you like science fiction, have a goofy sense of humor, and are ready to be entertained, break out the popcorn and enjoy a deliciously funny Space Milkshake.